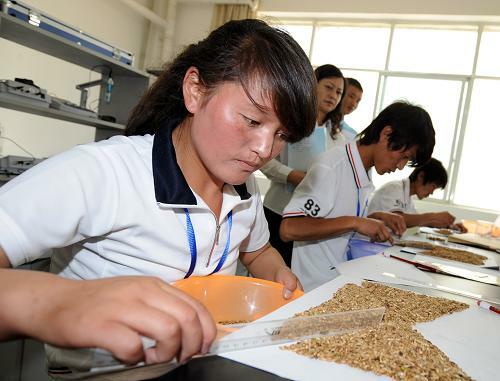 Students majoring in agriculture and forestry from Tibet Vocational Technology Institute are competing for seed selection skills on July 15, 2010, photo from Xinhua. As the only vocational institute in southwest China's Tibet Autonomous Region (TAR), Tibet Vocational Technology Institute held its second vocational technology competition on July 15, 2010. This institute boasts 29 specialties inclusive of agriculture and forestry, animal husbandry, electricity and architecture, etc. There are altogether 4,742 students, and most of whom are from the rural and pastoral areas of TAR. Each of them is required to master a professional skill after finishing his or her studies in the institute.